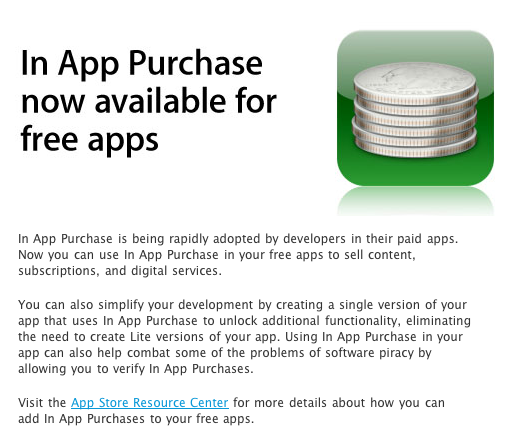 Apple has just announced that it will now support in-app purchasing for free applications on the App Store. This is absolutely huge news for developers, and will likely lead to a fundamental shift in the way applications are marketed and priced. It’s hard to overstate just how much this will change the App Store. Up until now developers of premium applications have faced a major problem: they had no way to offer a feature-restricted version of an application for free that users could pay to unlock if they liked what they saw — a model that’s quite common on desktop software. This led to the creation of the so-called ‘Lite’ versions of applications, which generally offer a reduced featureset, but require users to download an entirely new application to access more features, which obviously isn’t ideal. Now, they won’t face this hurdle. They’ll be able to ditch the Lite version entirely, switch their currently premium app over to free (which will lead to more impulse downloads), and give users the chance to upgrade their featureset down the road. This will also have a massive impact on free games that thrive on the sales of virtual goods, like Tapulous and Zynga. Up until now Tapulous has been unable to sell new songs through its flagship applications Tap Tap Revenge 1 and 2, because these are both free. In order to take advantage of the in-app purchase feature that Apple launched earlier this summer, Tapulous was forced to launch TTR3 as a 99 cent application. The app has still done extremely well, leading the Top Grossing charts for days, but it would have almost certainly gotten even more downloads had it been free. Likewise, games like Zynga’s Mafia Wars and SGN’s Mafia: Respect and Retaliation have had to offer Lite version of their games, not necessarily because they wanted to restrict features to users, but because they had to charge something so that users could purchase virtual goods down the line. It looks like Zynga and others won’t be able to use virtual currency, which Apple has basically forbidden. However, don’t be surprised if they offer “packs” of upgrades that you can buy. There have been various rumors as to why Apple restricted in-app purchases in free games to begin with. Some have speculated that Apple is concerned this will lead to many free apps that tempt users to download them and then do essentially nothing until you pay to unlock them, which is still a valid concern. Others believe it has to do Apple’s payment system, which may lack credit card information for users who only download free applications. 1.1 You may use the In App Purchase API only to enable end users to purchase content, functionality, or services that You make available for use within Your Application (e.g. digital books, additional game levels, access to a turn-by-turn map service). You may not use the In App Purchase API to offer goods or services to be used outside of Your Application. On Currency: 2.1 You may not use the In App Purchase API to enable an end user to set up a pre-paid account to be used for subsequent purchases of content, functionality, or services, or otherwise create balances or credits that end users can redeem or use to make purchases at a later time. 2.3 Content and services may be offered through the In App Purchase API on a subscription basis (e.g., subscriptions to a magazine, comic series, or financial reporting service); however, rentals of content, services or functionality through the In App Purchase API are not allowed (e.g., use of a particular game item or digital book for a pre-determined, limited period of time). Note: This means that content owners won’t be able to let their content expire. This probably won’t be welcome news to many of them.